Below are testimonials of clients who have worked with Leverage2Market® Associates’ principal, Linda Popky. Aerulean Plant Identification Systems, Inc.
“As my book, The Resilience Advantage was moving through its editorial process, I was disappointed in the quality of the editing work done by my publisher. Before I started receiving the final galleys, I knew I had to take independent action. After talking with several of my professional colleagues who had written successful books, one name kept coming up as someone who could help me with my editing. That name was Linda Popky. 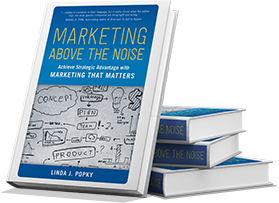 I knew Linda as an author, having read her excellent book, Marketing Above the Noise, but I had no idea that she also edited manuscripts. 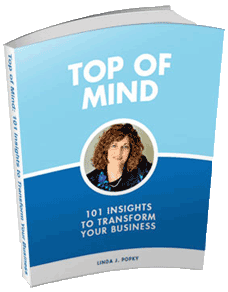 Chief Operating Officer, Oak Grove Enterprises, Inc.
“When I need coaching on the best way to market my business, I go to Linda Popky. She is always knowledgeable, relevant and knows when to bring in someone from her team of experts. “The Software Product Marketing (SPM) eGroup has taken a novel approach in building a vibrant, useful career & job site for software marketing professionals. The organization uses social networking theories implemented with software tools and processes to build membership and convince hiring managers, recruiters, and human resources personnel to post their open opportunities to the SPM eGroup membership. “We needed to ensure our channel partners were well informed about upcoming product launches and developments-in a secure fashion, before this information was made available to the general public. Linda’s team took on the challenge of creating and delivering a highly effective online briefing mechanism that not only allowed us to reach a large group of geographically dispersed partners in an effective fashion, but also significantly strengthened our relationships with our key channel partners. If you’d like more information, please contact Leverage2Market Associates.